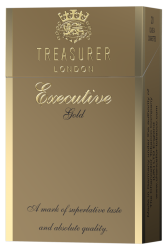 Grade A King Size 84mm cigarettes containing a superior tobacco. 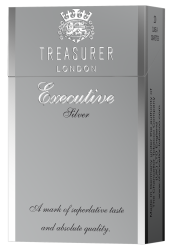 "Treasurer London" Executive range is presented in an ordinary traditional flip top pack however it maintains the stylish and trendy lines of other "Treasurer London" ranges. 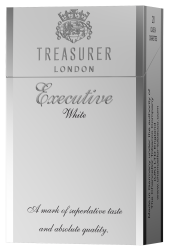 These cigarettes are reasonably priced for everyday smokers who prefer cigarettes from "Treasurer London" family. 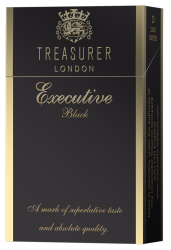 Although this range is priced at a similar level to ordinary premium cigarettes The Chancellor Tobacco still use the very highest quality tobacco and packaging materials and keep to the very highest standards to manufacture "Treasurer London" Executive range cigarettes. 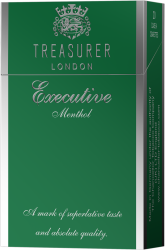 Every variety in this range has its own coloured tipping paper, inner foil and inner frame to keep its individuality within the "Treasurer London" brand. Each outer contains 10 packs of 20’s and there are 25 beautifully packed outers in a master case of 5000 cigarettes.